After you have completed your PADI Open Water Diver Course, or an equivalent certification from another organization, there are many options for practicing new skills and moving up the scuba ladder. The PADI Adventure Diver and Advanced Open Water Courses help you get more out of diving by introducing you to new types of scuba diving adventures. It’s a great opportunity to work with your instructor to build your scuba diving skills and gain more confidence. To obtain the Adventure Diver certification you need to complete 3 Adventure Dives, and to complete the PADI Advanced Open Water Diver Certification you need to complete 5 Adventure Dives including the Deep Dive and Underwater Navigation Dive. 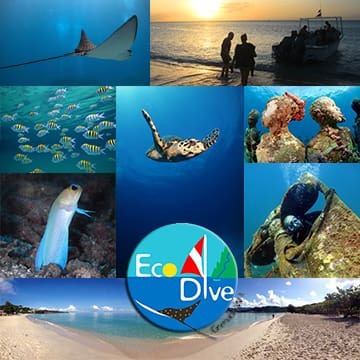 Adventure dives that you can do with Eco Dive Grenada include: Deep, Wreck, Drift, Fish ID, Naturalist, Digital Photography, Peak Performance Buoyancy, Search & Recovery, Multilevel Diver, Night Diving, and Boat Dive. The PADI Adventure Diver Certification can be completed in as little as 1.5 days if planned with one of our instructors in advance and 1 day if eLearning or independent study is completed in advance. The PADI Advanced Open Water Diver Certification can be completed in as little as 2.5 days, or 2 days if the eLearning or home study is completed in advance. This course is an excellent course both to teach (yes we love our jobs) and to participate in as a student or an assistant. This course upgrades Advanced Open Water Divers to include all the skills necessary to help yourself if ever you are in a difficult situation in the water and how to help others! This course includes theory development, confined water practice, self rescue skills review from the Open Water Course and then a whole range of new skills tips and tricks on how to expand your in water abilities to know you are ready to help wherever you are. A valid and up to date CPR & First Aid Certificate or enroll to complete your Emergency First Response (EFR) with us! A fantastic course, but intense. Please Contact Us.